Exterior storage Up to 38 cu.ft. Exterior storage Up to 48 cu.ft. Exterior storage Up to 67 cu.ft. Own a Wonder? Tag your Wonder photos with #ExplorewithWonder on Instagram to have your photos featured here. Configure your Leisure Travel Van. Find a Leisure Travel Vans dealer near you. Share your ideas and see them come to life. Enjoy a full sized lavatory complete with a recessed shower and plenty of storage. The Wonder features handle-free Fenix NTM® doors and gorgeous Natural Rift cabinetry. The fridge, freezer & microwave are completely hidden behind continuous clean lines. Every inch is utilized to provide an abundance of interior storage. The Wonder’s living area is incredibly spacious for a non-slide Class C motorhome. Entertainment features include a 28" LED TV, soundbar and Blu-ray player. You will be sure to sleep well in the Queen-size 60" x 80" murphy bed featuring built-in headrests. Enjoy a full sized lavatory complete with a 30" by 32" enclosed shower and medicine cabinet. A large Corian® counter extension flips down to create the largest countertop found in a Leisure Travel Van. 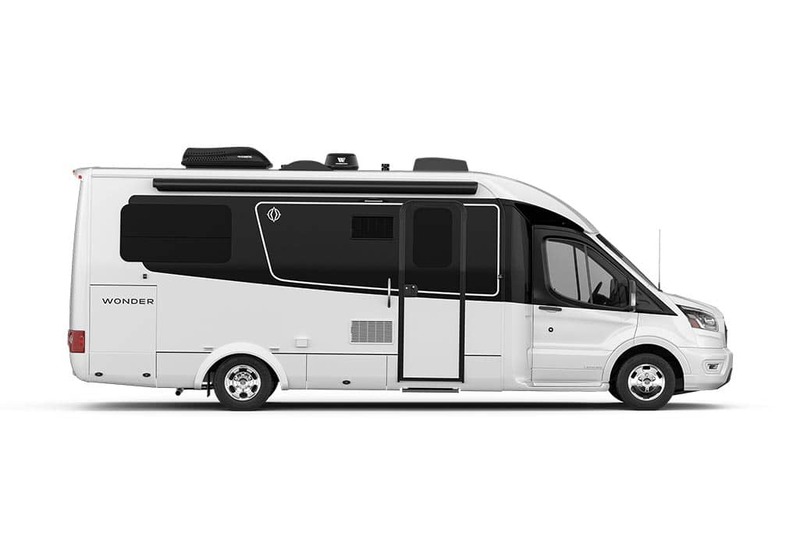 The Wonder RTB offers a separate bedroom area in the rear of the coach, a feature not often found in a sub-25′ motorhome. The comfortable 32″ × 76″ twin beds can also be slid together, forming a single bed wider than a residential Queen bed. Easily accessible storage can be found underneath the twin beds. North America's first exterior pass-through garage storage on a Ford Transit-based Class C. Large enough to house two full-size bicycles and much more. The innovative dinette table features two folding leaves, providing extra dining space when needed, and sits on top of a removable swivel mount, which can be transferred to an additional mount located in the bedroom area, creating a secondary dinette-like setting. 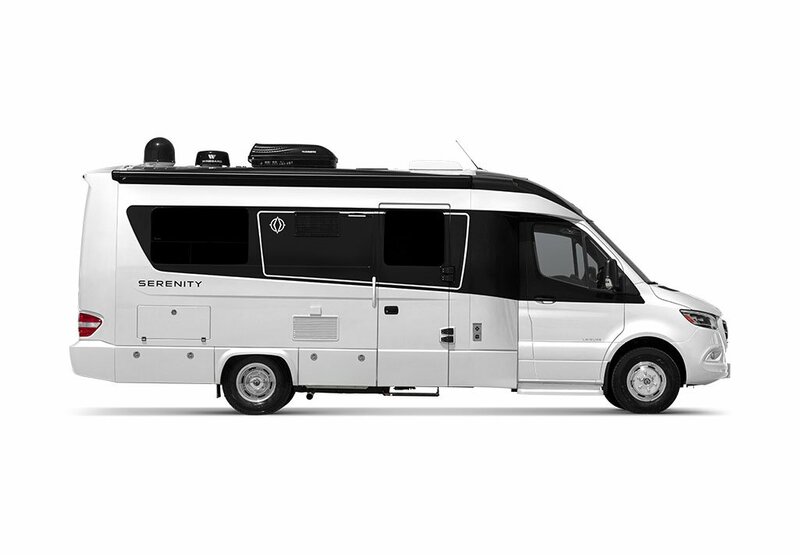 Innovative floorplan features open layout, spacious galley and lavatory, twin beds or single Queen bed (64" × 76"), and European-style cabinetry. Innovative Wonder Front Twin Bed (FTB) from the leaders in compact-luxury RVs, packed with smarter space solutions that combine modern design with functionality. Dealer Follow-Up I would like to receive more information from my nearest Leisure Travel Vans Dealer. Please insert a valid zip code. 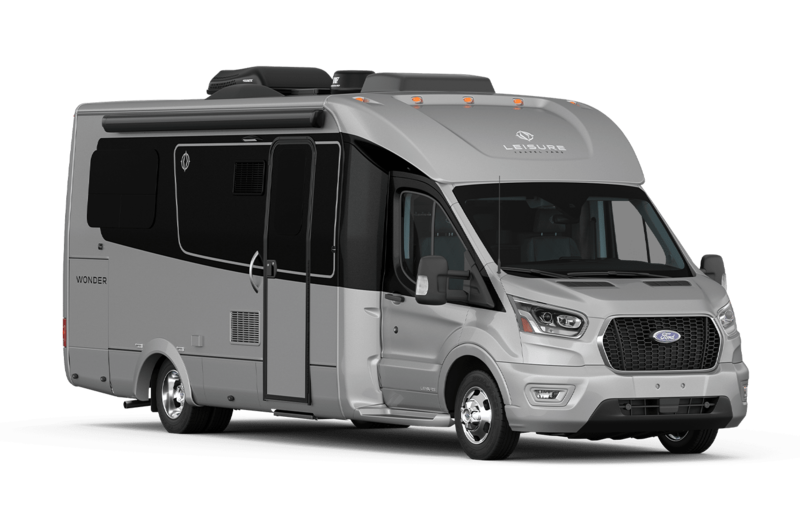 Stay in touch with Leisure Travel Vans Sign up for the LTV Newsletter and be the first to know about news, videos, product updates, and more. You can unsubscribe at any time. Please insert a valid zip code and/or find dealer.